Mass-producing car companies’ model line-ups are like tins of assorted biscuits. Unpeel the sticky tape seal, prise open the lid and luxuriate in that sugary waft of air that escapes from within. Observe the selection: there are simple, plain ones; big ones with hidden extras beneath their sparkly wrappers; and usually at least one that gets left to go soft because nobody really likes it. Toyota, like many big players, has long had an eclectic range of cars on offer, with exciting sporting models, rugged and adventurous SUVs and, being frank, quite a few worthy but bland models. These are the Rich Teas if you will: they do the job but are unlikely to be the first to be grabbed once the lid of the tin’s been popped off. Two years ago, Toyota rolled out the Urban Cruiser – a chunkier, more interesting offering based on an existing model. It’s no Rich Tea, more like a yet-to-be-retailed chocolate chip Hobnob. 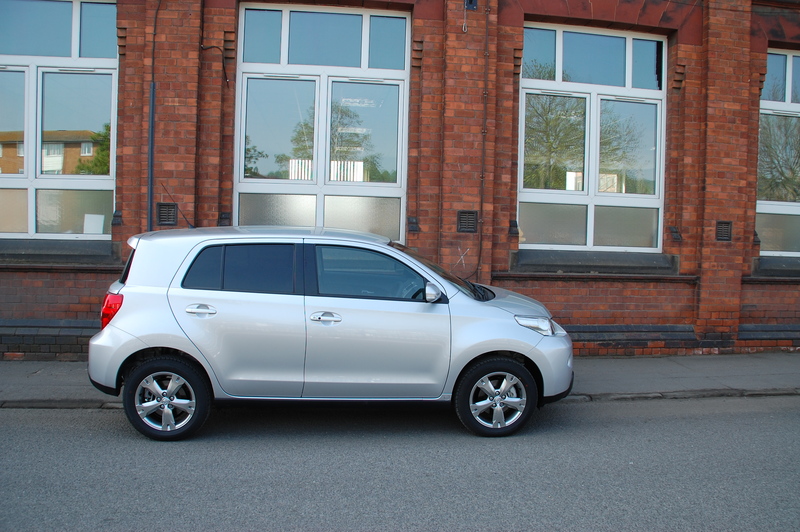 So what makes it different to the Yaris from which it’s been developed? The Urban Cruiser is a compact crossover, to use contemporary auto-maker parlance. That’s to say it’s taller and more practical than a conventional hatchback, in this instance with the addition of four driven wheels but without the tall look of the mini-MPV that some buyers find too insipid or small van-like. As the name suggests, it’s built primarily for use in built up areas, despite some stylistic off-road pretentions to accompany the all-wheel drive system. Its moniker may sound like it’s bordering on an unfortunate connotation, but it doesn’t appear to have been a deal breaker as they’re not an uncommon sight on the roads. Unlike many Japanese cars which major on their new models being engineered for, and in, Europe in marketing campaigns, the Urban Cruiser is a globally sold product, albeit one developed first and foremost for Japanese tastes. Not that the ‘Ist’ name used in Japan, or the North American ‘Scion xD’ branding are much better, though. And, the ‘Cruiser’ part of the name has become a staple brand of Toyota folklore – depending on where you live it will have been prefixed by Land, Space, Mega, FJ or even Fun. So Urban Cruiser it is – the bold letters on the rear number plate plinth certainly leave you in no doubt what you’re following. Somewhat unusually for a mass-market car brand, there are only two versions of the Urban Cruiser available – a petrol 1.33 VVT-i model with front wheel drive and this 1.4 D-4D common rail turbo diesel with AWD. There’s just the one, unnamed but very generous, trim level too. The five-door Urban Cruiser is unlikely to win any beauty pageants but its chunky appearance will no doubt win it fans who like the off-road look that remains popular. The big, protruding bumpers go against the grain of current fashion where such car park buffers are integrated into the overall design more seamlessly than ever before. They’re further endowed with unpainted ‘skid’ plates to reinforce the crossover theme. The styling is upright, with high set head and tail lamps, and further some interesting detail motifs to raise interest in the design, including bold wheel arches and a rising crease aft of the rear doors to the top of the roof. The 16inch high gloss finish alloys ensure the design looks balanced. Despite it sharing the wheelbase with the Yaris, it looks a larger, more substantial car. Once aboard, the spaciousness promised from that upright body does not disappoint. The dark ‘Otaru’ seat fabrics and main dash moulding do little to offset the sense of airiness either. The dash is modern in style, although it eschews Toyota’s fascination with both centrally located and digital instrumentation. Saying that, whilst the main binnacle is directly behind the steering wheel, it’s split into three pods, the central one of which houses both the speedometer and rev counter in a dual purpose dial. It adds a little visual flair but isn’t the easiest of dials to glance at quickly until you get used to the needle positions. As is commonplace these days, the major controls fall logically to hand, switchgear working precisely, the climate control buttons in particular being bold and simple to use. The only minor gripe is the mode button for the trip computer being nestled deeply in that right hand instrument pod and proving a little fiddly to manipulate when on the move. The dashboard and interior plastic mouldings feature two styles of finish. The vast proportion is dark grey with a relief pattern that looks a little like sports clothing, making a welcome change to the leather look of many car interiors. These are contrasted with shiny, metallic look trims on the doors and on the centre console which stands proud of the main dashboard and appears at first to be floating. In an age of slush moulded, soft touch plastics, the interior might disappoint those familiar with Volkswagen-like squidgy interiors, but the panels were impeccably well constructed and felt like they would remain squeak and rattle free for many years. For a car will be bought as a practical proposition by most customers, while there are a large number of storage spaces around the interior, they are not particularly capacious. The door bins are especially bereft of space, but on the upside there is a twin glove box, both compartments being of reasonable size, which is quite an achievement considering there are no less than seven airbags within the cabin. Despite this, the Urban Cruiser only achieved a 3 Star Euro NCAP rating, a factor which is an ever growing influence over car buyers these days, especially for models like this that will often be used to transport young families. The front seats are firm but didn’t feel uncomfortably so in the duration of the test. They do look a little flat and you feel as though you’re being held in place as much by the attraction between your clothes and the seat fabric as the side bolstering. Rear seat room is generous for a car of less than 4m long, although my scalp rubbed on the headlining if I sat upright, requiring a degree of slouch to be more comfortable. Legroom is impressive and four adults on a long journey would have no complaints about being cramped. Despite the standard rear privacy glass, high belt line and the very thick ‘C’ pillars, the outlook from the rear bench was fine, with all three seats having a three-point seatbelt and the outer two being ISOFIX child seat ready. This AWD model has a slightly shallower boot than its petrol sibling due to the mechanism to provide drive to the rear wheels. It’s a decent size at 305l and bigger than the Nissan Juke’s 207l, which many consider to be its most natural rival. The rear seat on the petrol version also slides back on forth – instead, this one provides more adaptability with cargo carrying, with both the seat back and base being split to give it van-like commodiousness. Standard equipment for the Urban Cruiser is very impressive. Besides the very effective climate control, buyers will also get for their money electric windows, power folding mirrors, good quality CD/radio with MP3 and iProduct connectivity, with steering wheel controls for both the stereo and Bluetooth phone control, a self dimming rear view mirror and ‘Smart Entry & Start System’, which is Toyota-speak for keyless entry and a starter button on the dash. As befitting the urban-centric character of the car, the delivery of the torque is geared towards lower speeds. This gives the engine impressive flexibility, especially when pulling away from junctions at low speeds in second gear. It allows for smooth, easy progress and despite that emergent power being transmitted to the wheels, the engine sounds unruffled and refined. Changing gears between the six forward ratios is equally pleasurable. Whilst the lever itself is quite long due to the low floor and high seating position, the throw is short, precise and feels like it slots into each gear with a well-damped satisfaction. The knob itself was wrapped in leather and felt good to the touch, although the flimsy gaiter below suggested too many pennies had been pinched on that particular cost saving. The Urban Cruiser is conventionally sprung like the vast majority of cars in this class with independent MacPherson struts up front and a torsion beam at the rear. Toyota’s engineers have worked impressively hard to give the car a cosseting level of ride comfort at lower speeds, soaking up bumps, potholes and manhole covers impressively well and muffling the vibrations sent to the bums of the occupants. The mature level of ride comfort is also apparent at higher speeds on back roads and dual carriageways, with the car, despite its slab-like sides, not feeling at all susceptible to cross winds. Body control remained good regardless of road conditions or speed. Whilst cruising comfortably around the national speed limit, the low down bias of the engine’s torque was more apparent when increasing speed to overtake: a small but noticeable gap between when the throttle was depressed to the motor winding itself up to provide the extra performance provided the evidence. Although still refined in terms of its feel and the delivery of the power, there was a perceptible increase in the boominess from under the bonnet under harder acceleration. Though no ball of fire, not that the Urban Cruiser sets out to be a performance car in any way, the 109mph claimed top speed and 0-60 sprint in 12.5 seconds felt within the realms of probability should legal conditions permit. According to the car’s computer, in spite of the mix of urban rat runs and back road blasts, it still delivered a welcome average return of 52.6mpg during my test. The steering was typically Toyota-light, in this case with power assistance by virtue of an electric motor. The cornering capabilities of the Urban Cruiser provided pleasant reassurance, although there was a tendency towards understeer when pushed briskly into bends. Unfortunately, this was countered by an over-assistance in the power steering. It felt somewhat artificial despite it being tuned to give varying levels of help at different speeds. The lightness around town was a bonus, no doubt, it just didn’t feel such an engaging companion on twisty B-roads. The wheel itself was leather shrouded and felt good to touch, although the rim could have done with another centimetre of thickness. The grip the chassis provided impressed greatly – under normal circumstances the front wheels handle 100% of the power but as they begin to lose traction up to half of it would be imperceptibly transferred rearwards. The system can be locked in place if the driver so wishes. Let’s be clear though, whilst drive to all the wheels provides excellent traction on the roads, and would be a fantastic ally against the snow and icy conditions that gripped the nation last November, it does not turn it into a cross country car. If you venture too far off the beaten track, you’re still as likely to get stuck as if you opted for the petrol model. It’s very difficult to pigeonhole the small Toyota crossover. Its appearance on the market provides a further indication of buyers moving away from larger cars in these financially frugal times. Buyers trading down in size though will still want something that makes them feel special. Urban Cruising along the boulevard de chic that is Lincoln’s High Street, its rugged physique attracted a few admiring glances. Perhaps in the deeper purple hue that features in the brochures there might have been more. Whilst it is stylistically more adventurous than some of Toyota’s mainstream range, for some it looks more like a tall, chunky hatchback rather than something other worldly like the C3 Picasso or Nissan Juke, just two of the rivals that buyers may cross shop against. In fact, within Toyota’s own range, the newly launched Verso-S may cannibalise sales for families looking for a small car with maximum flexibility. However, for many, the Juke might be too radical and the others look more like shrunken MPVs. The Urban Cruiser still maintains some of the off-road styling traits of bigger SUVs, like the acclaimed Land Cruisers from further up the Japanese firm’s range hierarchy. It’s maybe not the most innovative in shape or ideas, and while the interior is impressively spacious and has a wide array of oddments storage, none are particularly big, nor does it feel a particularly special place in which to sit. But, the ease of the driving experience and the compliance of the ride quality around town, where many of these will no doubt spend most of their time dwelling, could be a compelling argument for many. Combined with that persuasive five year warranty, excellent build quality, ease of use and ownership and an impressive array of equipment, Urban Cruiser buyers will feel their £17,855 has been well spent. Many thanks to Garry and Jonathan of Listers Toyota, Lincoln for their excellent levels of service and assistance, as well as supplying the car. I’m sure its apleasently accedptable little Japanese hatchback that will be just great round town for those who are no longer taken in by toys and badges BUT honestly Toyota are ‘avin a larf with that price. Trying to justify the price with a 4×4 makes no sense – just a much too expensive Yaris , and they’re around £10k aren’t they? The price does appear to be pricier than its main rivals, broadly comparing equipment levels and so on. Difficult to tell why – possibly exchange rates with £/€ v the Yen? The platform and mechanicals are generally common place in other models so development costs must have been relatively low. Small volume car so maybe they’re thinking “we’ll not sell huge numbers so pitch it as a premium product”? And, the button and toys count is still very important to a lot of people, let’s not forget – guilty of that myself. I suspect it sells particularly well to Toyota brand loyalists too.